You are here: Home / Tennis Psychology / Tennis Mental Game / Tennis Mind Games: Do You Crave Approval? Tennis Mind Games: Do You Crave Approval? A big challenge for many junior tennis players mindset is that they are too concerned about what others think when they play. Worrying about what others think is a huge distraction to your tennis game to say the least. I should say that you should care about other people close to you. However, caring too much about what others think about your game when playing a match is a distraction to your mental game of tennis. You can’t focus on each point and hit your best shots. We call this social approval in my work as a mental game expert in tennis. Social approval causes you to want others to give you respect, admiration, or wanting to be liked. You can’t focus on playing smart tennis when you worry too much about what others think! Most of the time, you will avoid mistakes or bad shots – not a good mindset to instill peak performance. I once worked with a young female tennis player who I will call Lisa. 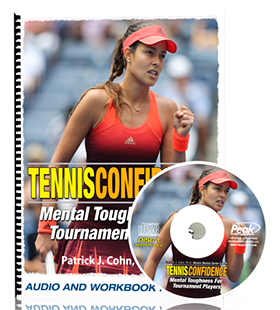 Lisa lacked confidence in her tennis game and wanted me to help her play with confidence. As we talked, it became clear to me that Lisa relied on other people for her confidence. If her coach or opponent did not say, “Good shot” to her after she hit a good shot, she would wonder why and lose confidence in her self. 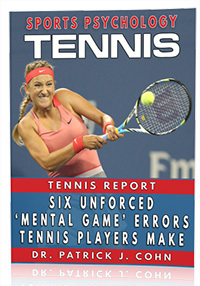 She assumed that her coach really did not like her because she did not acknowledge when she hit a good shot. She would think to herself, “I guess my coach is not happy with how I am playing or thinks I am a crummy player,” and then proceed to lose confidence. In addition, she was afraid of embarrassing herself when she played in tournaments. Her goal was to not lose 6-0 and 6-0 for fear of what others would say to her about her game. More importantly, what would they think about her as a person? I’m sure you probably want respect from other players and your coach. To begin with a strong mind game, you have to let go of what others may or may not be thinking about you before you play. To get your head in the game, focus on your game plan, how to execute shots, and one point at a time! To learn how to stop worrying what others think, check out The Fearless Athlete CD program.